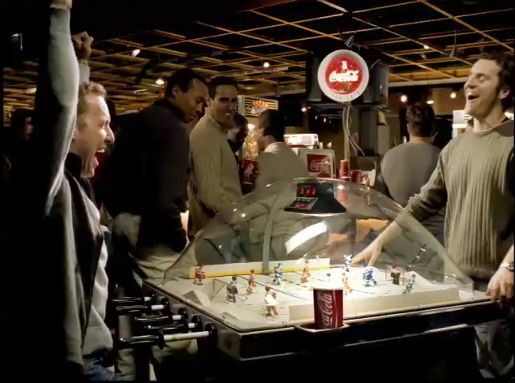 Coca Cola links in with the Vanouver 2010 Winter Olympics with “He Shoots, He Scores”, a television commercial featuring ice hockey. From the boy playing with a Coca Cola can, through to schoolboys and schoolgirls, professional players, table hockey players, spectators and fans alike, the cry is, “He Shoots! He Scores!” The final line, “Let’s make sure everyone knows whose game they’re playing”, appeals to Canadian national pride over their connection with the game of ice hockey. “He Shoots He Scores” was developed at MacLaren McCann, Toronto, by art director Bob Goulart, copywriter Dave Hamilton and agency producer Jan Riley. Filming was shot by director Pete Henderson. Editor was David Baxter at Panic & Bob. Sound and music were produced at Imprint Music, Toronto. The track can be downloaded from iCoke Canada.